You always access applications in the Control Panel. Irrespective of which program you open, the path to the control panel is always through a separate window which can be tedious. You can access the individual programs directly from the Start Menu. For that, right-click on ‘Start’ and select ‘Properties’. Then in the ‘Taskbar and Start Menu Properties’ dialog, click on ‘Customize’ in the ‘Start Menu’ tab. If you are using the classic Start Menu, in Vista, set a checkmark in the following dialog in ‘Advanced Start Menu options’ before ‘Expand Control Panel’ or in XP before ‘Open Control panel’ to activate the concerned option. Confi rm this with ‘OK’. If in the ‘Taskbar and Start Menu Properties’ dialog, the option ‘Start menu’ is selected, then the dialog ‘Customize Start Menu’ opens. Search the ‘Control Panel’ entry in Vista in the list in the upper half of the dialog. In Windows XP, you will fi nd the entry in the tab ‘Advanced’ in the list ‘Start Menu elements’. Under this entry, you can select between the options ‘Display as menu’, ‘Display as a link’ and ‘Never display’. 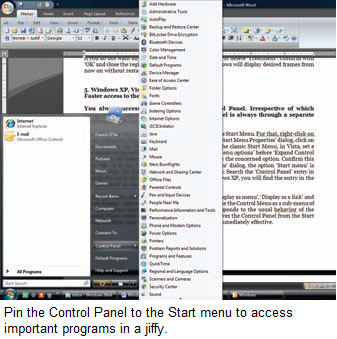 Activate the fi rst mentioned option to use the Control Menu as a sub-menu of the Start Menu henceforth. The second option corresponds to the usual behavior of the Control Panel, while the third option completely removes the Control Panel from the Start Menu. Confi rm your choice with ‘OK’. The change is immediately effective.